How To Fix Your Stuff - Does My Computer Need More Memory or RAM? Does My Computer Need More Memory or RAM? This method will work on any Windows 2000 or later computer. A quick way to determine if your computer needs more memory (RAM) is to use the metrics in the Performance Tab of Task Manager. The method should be used during your "normal" usage, meaning that if you normally have an Internet browser windows open and your email program like Outlook and maybe Word or another word processing program, you should open all those windows and open a couple of web sites and documents. In other words, open all of your programs and documents just as you would use your computer at an average working time. Please note that this is a very basic method that will work in most cases. There are many factors that will determine the memory load within Windows at any one time. 1) Open Task Manager by clicking Start, Run, type taskmgr, click OK. Other ways to start Task Manager are press CTRL+ALT+DEL and click Task Manager button or right click on an unused are of the task bar and select Task Manager. 2) Click on Performance tab. Check the Physical Memory (K) Total. than what you understand to be installed. This is the amount of RAM that Windows is currently using. This is the important number that determines if you need more RAM. If this number is greater than the Physical Memory Total, then you need more RAM for best performance. The more this number exceeds the Physical Memory Total, the harder your computer is working to use virtual memory which degrades performance. The amount of excess commit charge is the minimum amount of RAM you should add to your computer. For example, if this number were somewhere around 1500000 (1.5 gig) which exceeds the Physical by .25gig or 250meg, you should add at least 256meg but I would suggest adding 512meg. The Peak is another important number to note. It represents the maximum commit charge since the computer was started. If this is a much larger number than your current (total) commit charge, then at some point there was a program or process that required a large amount of memory and caused this spike or peak usage. If this is something you see consistently during different days or sessions, you should either find out what the process is that caused it (see below), or add enough RAM to your computer to cover this peak load. 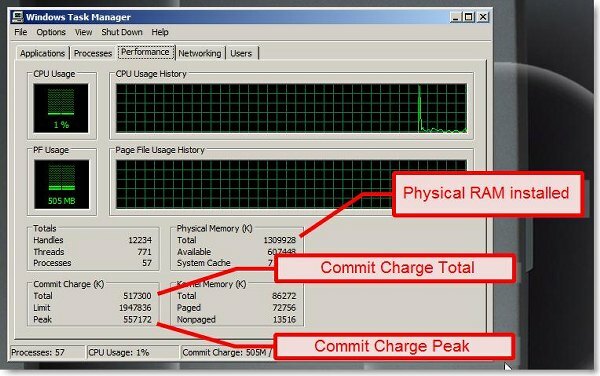 The bottom line is to have enough RAM installed in your computer to cover the Commit Charge total, and possibly cover the Peak. This will keep your computer running smooth and at top performance. More RAM is always better right? Yes, but it may be a waste of money. If you were to spend the money to stuff your computer with 4gig of RAM but you never used it, then it is a waste of money. For example, if you had 4gig of physical RAM but the commit charge never exceeded 1gig, then the additional 3gig does not help you at all. I sometimes hear people brag about the huge amounts of RAM they purchased with their new computer, but they are the type to never do more than write a few Word docs, read email and browse the Internet.. Who Cares? Maybe this person's ego cares, but his computer could care less for sure. This person would do much better to upgrade the processor then to have spent the extra cash on RAM. More advanced methods for tracking memory usage are available by using Performance Monitor, but that method is beyond the scope of this article and generally beyond the skill set of an average user. What programs are using up memory? This is a simple method to find out what programs, services or running tasks are using up memory. This combined with the method above, will help in understanding the memory usage of your computer. This can also help to identify ill behaved programs that may have memory leaks and/or programs that are a heavy load on resources. 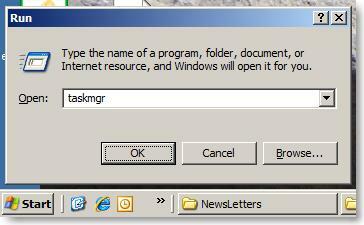 1) Open Task Manager just like #1 above. Click on Mem Usage column two times to sort it descending. If the Mem Usage column is not shown, Click on View menu, Select Columns, Check Memory Usage box, OK. 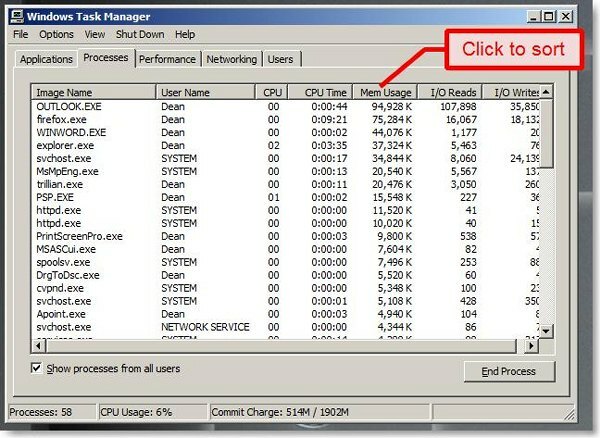 The top programs (Image Name) are the programs using the most memory, indicated by the Mem Usage in K. If the Image Name does not look familiar and you want to find out what it is, do a Google search for the image name and there will be a number of results (Like AuditMyPc.com and File.net) that will describe what it is and how to get rid of it if you need to.